Not spending money? No need to worry there’s lots to do! 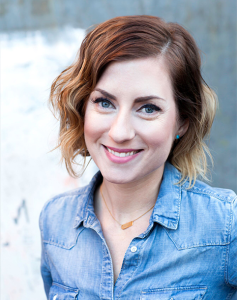 If you’re one of the 200 million Pinterest users then this one is for you. You know all those pins that you have on your boards? This is the perfect time to make some of them. The challenge: only tackle the projects that you can do with supplies you already own. Check out all of their movies from the library or watch them all on Netflix. Another idea- decide to have a movie marathon theme night. Some ideas: 90’s movies, cult classic movies, cheesiest movies ever made, worst movies ever made, and the worst horror movies ever made. Have old gift certificates that have sat around since the last holiday season or from your last birthday? Some gift certificates expire, some charge activation fees (gasp- the nerve!) and you’ll never believe this- some companies will take a percentage off the card for each month it hasn’t been used (double gasp!). Don’t let those gift certificates go to waste! Still can’t find anything you like at the store? This could be a great re-gift opportunity (as long as the gift certificate is not going to expire super soon, and as long as in it’s original wrapper still looking crisp and brand new). Also, consider listing the card on Craigslist, Facebook, or Card Pool. Likely you’ll only be able to get a percentage of the card’s original value but it’s better than nothing since letting it sit in your junk drawers will do you no good at all. OR, you can trade-in your old stuff to get gift cards that you’ll actually use! Use your cooled morning coffee grounds as a full body exfoliator, soak your feet, put a warm washcloth over your face, turn on your favorite relaxing free radio stations, and use your imagination to pretend you’re in a luxury resort laying by the poolside as a tan pool-boy serves you free! (Hey, let’s go for it) ice-cold drinks. Would you much rather be out shopping than doing just about anything? Pull out your clothes and come up with some new outfit combos. You might have far more outfits than you realized. Posts to get your ideas going: How To Wear One Look a Zillion Different Ways, How To Transition Summer Clothes Into Fall, and Wearing Scarves to Pump Up Your Style! There are lots of different potluck options: breakfast, dessert, appetizers. When everyone brings something the burden for one person to pay for everything is lifted. I recently went to a themed potluck where everyone brought something related to pumpkins! It was awesome! I brought pumpkin spice cupcakes with brown butter cinnamon buttercream frosting (so good!). Pick up a community paper or look online for your city’s free event listings. Back-up your digital images, and make a plan for getting them printed. Get that story written and those memories jotted down. Compile all of your good memories in one place. When you’re feeling crappy open it up to a random page for an instant boost. Include those silly things that happen in life that crack you up and make you really to-the-gut happy, you know the ones. You just need a good, solid little notebook. There are a ton of talented people out there in your very own city just waiting for an audience to entertain. Get out of a work-out rut and switch up your gym. See 4 Reasons Why Your Wallet Wants You to Adopt a Healthier Life ASAP. 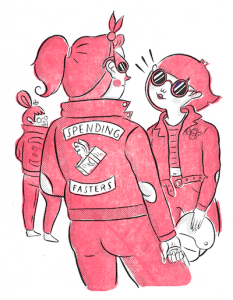 Get your friends together, and trade what you no longer wear (or want) for something new-to-you. Leave random nice notes all around town. Some ideas for your notes: “You can do it!” or “You’ve got this!”; it just might be the sign someone has been looking for to take the next leap in their life. Hang the notes on light posts, tuck them into car doors and windshields, leave them on community cork-boards. Spread around kindness and awesomeness and it will come right back to you. It’s the craziest thing but goodness boomerangs! Check out: 134 Ideas for Random Acts of Kindess to get you started with ideas! Bonus tip: Start a blog! 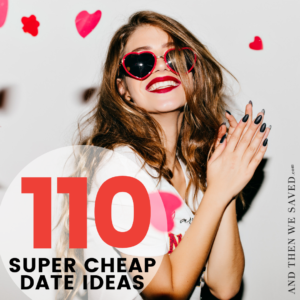 Tons of great ideas, and I really love the 1 picture per hour idea. It would be cool to document your entire day like that. Would put a whole new twist on catching up with your partner at the end of the day on how both of your days went. Glad you like the idea mike! that would be cool to have both you and your partner do the photo an hour! nice twist! We have a Half Priced Books where I live and they sell new and used books and magazines. I get all of my magazines from them, they may be a month old but they are only .25 each! So I save a bundle! You don’t think the magazines at the library have been thumbed through???? No 28 is truly awful! I don’t want to buy a magazine which has been thumbed through by someone else. Go to your local library & read the magazines there. Every time I go to the grocery store there are tons of people reading the magazines in the magazine aisle. If you think you are getting an unthumbed through magazine at any store, think again. I agree that #28 is terrible: both expecting coffee shop owners to provide a cup and hot water for your tea (it’s not free for them, they have costs to cover), and reading magazines that are for sale. Really enjoyed the rest of the ideas though. These are awesome! And as well as stopping me from spending, will probably stop me from eating from boredom, which I do all the time. Thanks! Glad to hear that Dorothy! I get into trouble when I’m bored too. love the list, Anna! makes me want to go for a run and have a nap and clean and declutter! Hah! It’ll keep ya busy for awhile! Going on a Picnic is a great way to get outdoors and for some added fun, invite some kids along. Walking to the grocery store is way to get rid of a few calories, enjoy some great weather, and strike it off the to-do list all at once. The playground is another good place to get some laughs as you and your friends relive the childhood games and share funny stories. I love a lot of these suggestions – particularly “take a picture an hour” and being anonymously nice. First of all, taking a picture an hour will not only be interesting for others (maybe.. depending on what type of life you lead) but also may put things in perspective for you. If the pictures of what you are doing consist of the tv and only the tv, maybe it’s time to start being more productive. And who doesn’t want to be anonymously nice! There are so many things we say we don’t have time for but this shouldn’t be one of them. I like how you took the photo an hour tip to the next level… to see how it could be an evaluative life tool. This was a very helpful article! Thank you for sharing. Being a single Mom…I need to come up with fun activities that are free…and there were some good ideas in here. Plus, I need to cut back on spending and this was helpful. Hey Laura, I’m glad it’s helpful! If you find some free activities that become you really like I’d love to hear what they are. Skype is not free computer to phone. It is only free computer to computer. Ok cool. Thanks for letting me know. Skype calls are free to a phone when the user has the Skype app (as opposed to calling a phone number). You just have to be sure to watch your data use or have an unlimited data plan to avoid overages. Skype is free to a mobile phone asking as the user has the app. The only thing you have to watch is data use or have an unlimited data plan to avoid overage charges. Okay, that’s good to know and thanks for the data reminder. 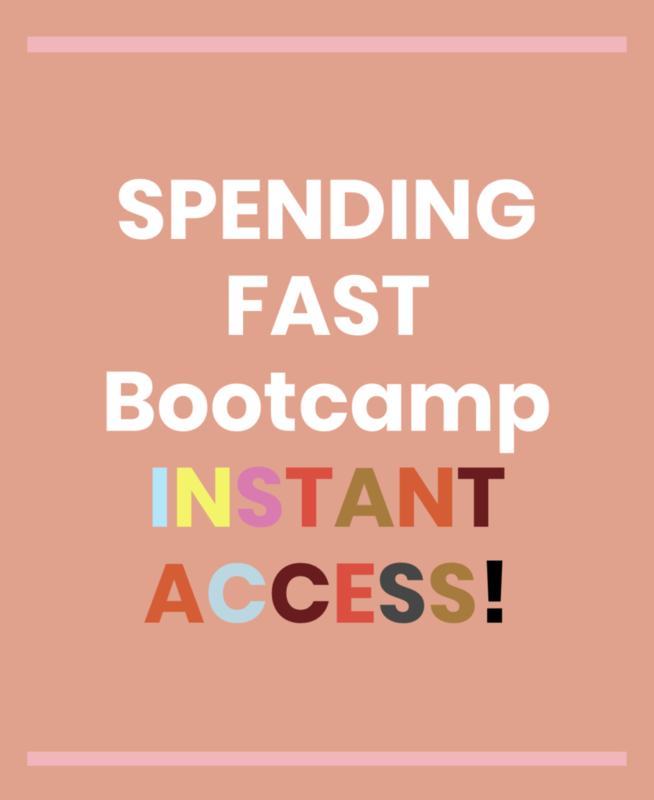 Wow I am doing so many of these things already… even before reading this AMAZING blog! These things make you feel soooo connected and make such a difference! That’s so awesome that you’re already doing a lot of them! I agree Tan, connectness is super important! This post is awesome. I reference it every day when I get home from school to keep myself from wasting time looking at clothes online or watching too much TV. Thanks so much! Pingback: Link tag Tuesday #105 – free activities, marijuana and back to the future! I love this…It’s a long weekend and I’m checking this list for ways to fill the hours. Let me know if you come up with any other fun ideas! Oh this is just what I’ve been needing! I seem to spend my paychecks way too fast these days. I think the first thing I’ll do is the clothing swap! very cool! i’ve gotten the most amazing things from swaps! things like: a brand-new jcrew wool (!) blazer and this super cool vintage purse. let me know what treasures you get! Thanks for the great ideas! I just started my new “frugal lifestyle” a month ago by getting a second (more fun!) job. It has kept me really busy, so I don’t have time to go shopping because I’m bored. I find I’m much more productive in what little spare time I have, and when I do make plans to see friends, I have an incentive to get things done around the house, faster! I will definitely try some more ideas you have on this list. Thanks, again! I’m happy to hear about your new frugal lifestyle! I used to do a lot of bored shopping too (and still fall into it sometimes). Keep me posted on your progress! I like the nap idea. ;) Calling people on the phone can’t hurt either. I’ll have to try the happy book. I like that idea. This list is amazing…I´m from Argentina, en 2001 was a very hard crisis…now i live in Spain, In Canary Island of Tenerife..again a big crisis reach me…But the first crisis let me many things…a Thyroid cancer and that the more important is …have health. Everything get if you´ve got health. I´m always making new my dresses…my blouses…with a pin…a fabric flowes…my shoes too…with crochet flowers of many colours…The crisis is the best thing that coud hapens by albert Einstein. Send you my salutations adn sorry my englihs is bad…God bless you..!!! Did you spend that 24k on your smile? Dumpster diving is a frequent “hobby” of mine but there are a couple of things to consider: 1) is the item by itself? It could be a Craigslist or Freecycle item for someone picking up later (if you are brave, knock on the door and ask); 2) if the item needs repair do you have the time/money to fix it? Defeats the money saving idea of dumpster diving! I love this blog. 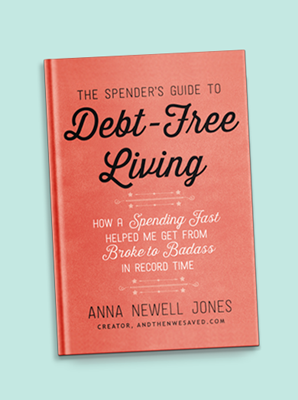 It has some really great tips for living on an over tight budget without going insane. I actually do #28 all the time. I always keep a couple tea bags in my purse. If you are going to get coffee with a friend but don’t want to spend the $3, you can ask for hot water (sometimes costs a dime) and you’re set! Pingback: The Endless To-Do List | What Just Happened There? You should give credit to this photo that is from the 2009 San Francisco Bike Expo’s fashion show. Hi, Thanks for letting me know more info about this photograph. I gave credit per the Creative Commons license and where I attained it so I will add this info to it. Make a fort? haha, nice article, I’ve just written a similar one myself… and actually began surprising myself with all the creative ways you can save money. Heck yeah! Forts are awesome;) I’d love to see your list Nick. I just found out about Geocaching actually and it’s included in another post about free/low-cost family activities- such a cool idea! I just stumbled onto your blog because someone had pinned this article–I have to say that I absolutely love it! I have been feeling terribly blue because I simultaneously am trying to save money to purchase a car (much needed!) and pay off my student loans….but you have encouraged me! :) I also wanted to add something to your list here, for the lifelong learners, or just the curious. A friend recommended coursera.com to me: free classes on basically anything by wonderful college professors from a variety of institutions across America. It’s marvelous! Again, thanks for the blog–I’m reinvigorated to head to work tomorrow and then on to my want less, spend less, be more free goal! Whoa! Very cool! I had never heard of that site before. Also, I’m so glad to hear that you’reinvigorated! xo! I’m so glad to hear that you’ve found encouragement here! And I can’t wait to check out coursera.com- it sounds amazing! coursera is awesome – do check it out! I’m a teacher and have taken many online courses and this one has the best of choices. You’ll find tons of things on it that you’ll want to take! Good luck to you! Try out new eye shadow and eyeliner looks! The times when you are bored at home are great for attempting risky makeup looks :)! I love this post! just found your blog on pintrest and I’m excited to explore it! This is gonna be great for college next year! This post was just the thing I needed to better use my time; thank you for sharing! Thank you so much for this blog! I am going to print this list and put it up somewhere where I can see and read it everyday. I already do a lot of these things before I even came across with it on Pinterest. But I have days of depression and boredom and forget that there are so many things that I can do than go out shopping to feel better..
I’m so glad it’s helpful to you! xo! Just stopping back by to say that I finally listed some books on Amazon thanks to this great article’s suggestion! I’m excited to get a little extra cash back into my wallet–thanks for the ideas! I love going to book stores and flipping through magazines. I always try to be very careful so they don’t look used or anything after I look at them. Another than you can do is bring your own tea bag and just ask the coffee shop for a cup of free hot water. But I’d suggest swapping out #39 “See if you can return anything you’ve bought”. The vastest majority of items cannot be returned after a 14 day period and it’s absolute torture for sales associates when customers get upset about this simple fact. I’d recommend switching this with “Swing by the library”. Borrowing cards are free and there is no sales pressure, as all books are on loan. Something about books makes everything a little better. Hey Anna! Loving this blog. I live in Newcastle, Australia and I love that so many of your suggestions are geared towards consuming less and re-cycling what you have! Good of you girl. Keep it up. I can actually get exhausted from online window shopping! I do recommend it though I have found that often I come back days (or even weeks) later to some of the window shopping I had done and not be able to resist the temptation to buy. I totally hear you! I get the same way. It’s nice to window shop online and to be able to easily close out the browser and find something else to do. I love how easy it is to remove the temptation when needed. How about adding clean out your closet, list clothes on ebay? I noticed you mentioned Craigslist but my goal is to get some traction out of my “old-larger sized” clothing and post on Craigslist rather than just donating. If they don’t sell then I’ll donate. Another idea that a friend of mine made me aware of is not only can you borrow books from the library but you can also borrow e-books and audio books for free from your local library system. I’m reading “The Girl that Played with Fire” on my Ipad that would have cost $9.99 in a download from Amazon. You don’t have to own a Nook or iPad but it helps! That’s a good insider tip that I don’t think many people know about. So easy too! So glad to hear that you like the list and that it’s inspiring! One idea I’ll add is to have some fun playing a free on-line game. There are tons of game sites that let you play either a completely free game (often with ads) or 1 hour free demo of a paid game. Big Fish Games is my favorite. Alternatively, there are MMO (Massive Multiplayer Online) games that are free to play, if you’re into more of the immersive world of role-playing games. Neverwinter is the newest of these, and worth checking out. Good one! I hadn’t thought about that! Love them! Great when you’re living on next to nothing but need to do something with your day other than browse tumblr and watch supernatural. Having a social life is so difficult when you have no money but these ideas are wonderful. All of your links seem to point to andthenSHEsaved.com, which doesn’t exist any more. I sure hope you’re still around! I’m still around! Just got some wonky stuff happening on the back-end. The links should be fixed in no-time. Sorry about the trouble! 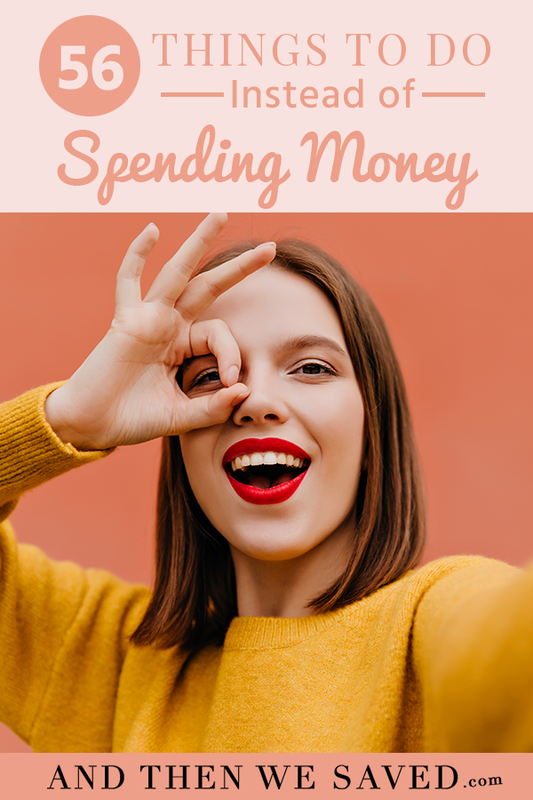 I love your blog full of ideas on how to keep over spending in check. My aha moment was when I found myself donating large bags of useless stuff I purchased and then donated to Purple Heart. Every time they called I had a large garbage bag full. Now before I purchase anything I think about this bag of stuff ! AWESOME list!! Can’t wait to try some of this stuff out. It sounds like when I go on a spending fast, I’ll have alot more free time. :) Being at home isn’t so bad- I could potentially get LOADS of stuff done! Good ideas, nice that you share them with other people. My husband and I live rather frugal, so we are allways on the lookout for new idea’s. Some ideas from our household: our local library has dvd’s you can lend for free. On rainy days we pop some corn, close the curtains and watch a dvd. Or we play a boardgame (my favourite is cluedo). I go window shopping and don’t take any money. If I am thinking about new clothes, I try on and then later take my husband back and see what he thinks. Then I save for it. Window shopping without money is good exercise (especially if you are walking to and from the store. Also a good way to get out of the house and have a change of scenery. What a fantastic list! I especially love taking a picture every hour. I might do this with my nieces this summer. They will use any excuse to play with my camera! you can either read a book or magazine in your local library, or paint your nails at home both activities are my stress reliever and also I make some cash by participating in community yard sales! Fantastic! I’m sharing this with my bankruptcy clients. Great to hear. Hopefully it’s helpful to them. Hi Anna – as usual – fantastic list. One thing you can do – is get a part time gig doing something you love. For example – I love meeting new people and driving – so to stop spending money – I became a Lyft and Uber driver. I made money, met new people, got to know the city even better ! this stuff is all boring! So not saying anything negative because at least it is creative but at a certain point in every one of these ideas except for maybe 10….YOU Still Have To Spend Money… Just saying. Thank alot for sharing great ideas to do when bored. It is really helpful but there are different other things you can do when you are bored such as reading funny jokes, motivating yourself by reading inspiring quotes of great minds, solve tricky and logical puzzles and questions and watch interesting videos. Here is the website I like when I am bored http://funthingstodowhenbored.com which is worth to check out. Enjoy your local free art galleries or art centres. I was just on the net one day and it was raining. I then thought to myself; “what can a 18 yeard old like me do for fun without spending any money?” And so I did some searching until I find this awesome website. I tough that the person who made this website also must be awesome. And yeah. It’s true. You’re very smart. I would’ve love to merry a lady like you. Thank you for sharing this Anna. It’s very helpful. I already started doing a vew. I think camping in my backyard would be a great idea. Thank you for the blog, it is positive and helpful, just what I need to assert myself. There is something soul satisfying about entertaining myself and others for free as apposed to buying it. In turn I feel grateful. In the morning I am walking 4 miles there and back to a car boot sale, getting the exercise and people interaction I enjoy. a single thing like that before. So wonderful to find another person with some original thoughts on this topic. 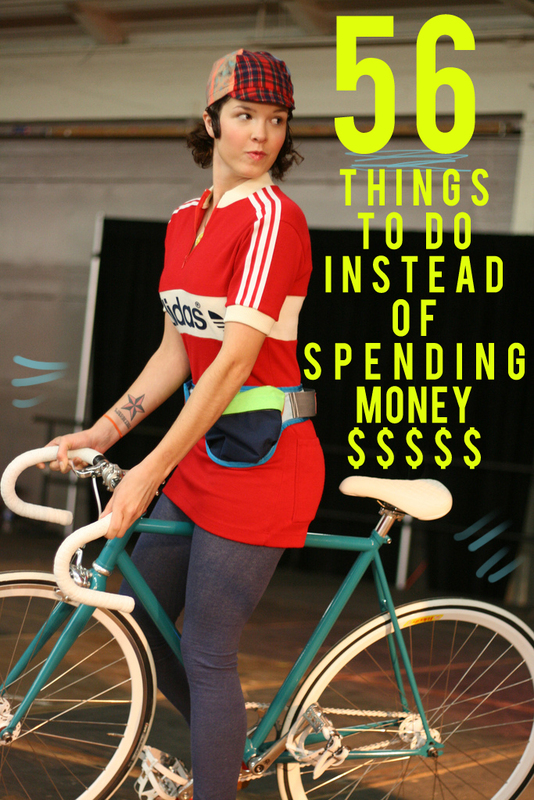 There are a ton of things we can do to get out of the house and have fun without spending money. How about just a nice walk with your dog or your spouse? Doesn’t cost a dime and it feels great.